THE BOOK FROM LIFE ON OLD ATLANTIS from ca 21500 years ago. "A Dweller on Two Planets"
Prince Menax had apparently lost his son, and the telling person here- Zailm - reminded him of his own son, and thereby he so adopted Zailm as his own son who was graced by this. Menax had also a beatiful daugther -Anzimee - who Zailm loved. He had secret wishes to marry her. "When, according to request, I arrived at the Agacoe palace on the next morning, I proceeded directly to the private office there occupied by Prince Menax, expecting to find my father alone (he was then adopted as so called him his "father"). "Should we not now go to the Incalithlon?" "If it please thee. And thou, Zailm(the teller of the story here), accompany us." "A palace car was summoned by the Rai, and came rolling along into our presence without any person to operate it; came in at the door of the office, which opened to allow its passage precisely as if some court page had opened it. It wheeled into the room and came to a stop in front of us. All this was done exactly as if under a guiding hand. But no visible hand was there. This was the first time I had ever seen any exhibition of occult power on the part of Gwauxln; indeed I never saw many examples of his power, notwithstanding his high adeptship. Like all true adepts he was exceedingly chary of such object lessons, disliking to show his knowledge before those not possessed of sufficient common sense to know that any acts of the sort were but examples of the control of nature through an understanding of higher laws than the ordinary mind perceives in its natural surroundings; but I was not one who saw anything miraculous in the occult; if I understood not the process, I did understand that it was but the operation of some unfamiliar law. Hence Gwauxln was not averse to allowing me to witness his power at times. The car conveyed us to the vailx-landing outside, where we found a vailx of small size, into which Rai Gwauxln courteously assisted first Menax, then myself, and himself entered last. Here was a spectacle worthy of note, the ruler of a mighty nation without the display of a single attendant, not more deferential to rank than to those of inferior station. True, as a Xio-Incali, Gwauxln had command over mechanical service which was more regal far than a retinue of menials could be. cases wealthy and luxurious in their habits in life, were entirely unostentatious, as their Rai set them example. "The great temple of Incal ("god") was distant several miles, but a few minutes sufficed to bring us to its huge structure. Outwardly the Incalithlon was shaped like the Egyptian pyramid of Cheops, not quite so high, but covering an area of twice as great extent. No windows pierced its sides, and sunlight or that of day never entered its interior. Besides a number of small apartments, the building contained one vast hall where was space for several thousand worshipers. The Poseid habit of copying nature was followed in this sanctuary with extraordinary faithfulness. Instead of straight walls, or alcoves, or the ordinary arrangement of interiors, the enormous auditorium was in faithful semblance of a cave of stalactites and stalagmites. In placing all this calcite, utility was consulted with regard to the stalagmites so that too much floor space should not be occupied by them. But the stalactites, being pendent from the marble ceiling, had been placed as thickly as space allowed and sparkled like stars in the light from the incandescent lamps swung midway between them and the floor below. From the latter point of view these lamps were concealed by broad concave shades so that their glow was wholly invisible from beneath, but shining upwards was reflected from myriads of sparkling white needles, filling the temple with a steady and. soft, but powerful, light that seemed to emanate from no special point, but from the air itself, a light well adapted to religious meditation. ...The Incaliz (or high priest, ) arose and bade us to follow him into the triangle of the Maxin, or Divine Light, in front of the Holy Seat. Deferring the relation of our subsequent action, I will describe this especially sacred part of the temple. It was a raised, triangular platform of red granite, several inches higher than the floor of the auditorium, thirty-six feet between its points. In the very center of it was a large block of crystal quartz, upon the perfect cube of which rose the Maxin. This seemed a flame, in shape like a giant spearhead, and it cast a light of intense power over all things around, yet one could look at its steady, unwavering white glow without desiring shade for the eyes, even though these were not strong. Over three times the height of a tall man it stood, a mysterious manifestation of Incal, as all spectators believed. In reality it was an occult odic light, and had stood in that one spot for centuries. 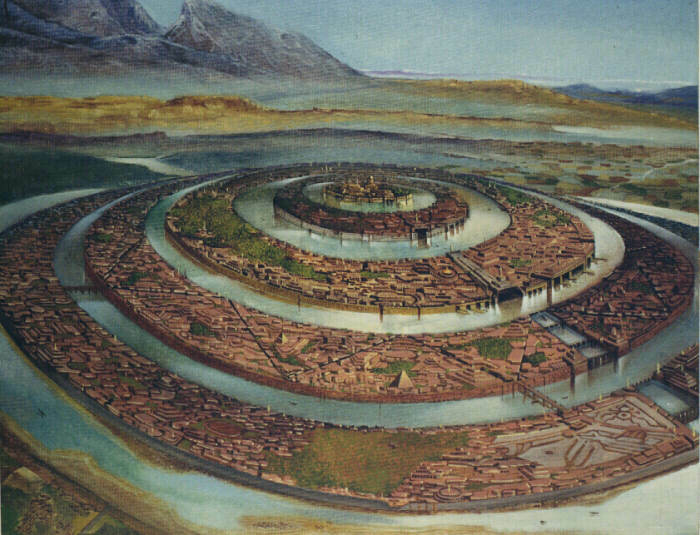 It had witnessed the grander development of Poseid and its capital city, and had seen the original temple of Incal (a small architectural structure, unworthy of a great people) torn down, and the present Incalithlon built around it. It made no heat, did not even warm the quartz pedestal; yet for any living being to touch it was fatal in the instant of the rash act. No oil, no fuel, no electric currents fed it; no man tended it. Its history was peculiar, and can not fail to interest thee, my friends. "I am from Incal. Lo, I am a child of the Sun and am come to reform the religion and life of this people. Behold Incal is the Father and I am the Son, and He is in Me and I am in Him." He was asked to prove this claim, whereupon be laid his hand upon a man born blind, and the man received his sight and saw with the doubters that his deliverer stooped to the pavement of the triangular platform, and with his finger drew a square five and a half feet either way. Then he stepped outside of the lines indicated, and at once the great block of quartz appeared, a perfect cube, in the place. Standing by its side he placed his finger upon the rock, and blew thereon with his breath, As he withdrew the finger, the Maxin, or Fire of Incal, sprang up, and thus had cube and Unfed Fire remained during all the centuries since. It is needless to say the proof was satisfactory, and thereafter the mysterious stranger revised the laws and provided then the code which had ever since governed the land. He had said that whosoever should add to or take from his laws, that person should not come into the Kingdom of Incal until "I am come on earth for the final judgment." "Hearken unto me. This is my law. Behold it also written on the Maxin-Stone. No man shall remove it, lest he die. Yet after centuries have flown, behold the Book shall disappear in sight of a multitude, and no man shall know its place. Then shall the Unfed Light go out, and no man be able to rekindle it. And when these things have come to pass, the day is not far off when the land shall no more be. It shall perish because of its iniquity, and the waters of Atl shall roll above it! I have spoken." "The day of the "Dismal Prophecy" had been looked for as the decades passed into centuries, but its time was not yet come, and though many alarmists set days when it would surely come, it came not, and the Unfed Light continued. According to the law, bodies of all souls which had passed into Navazzamin were cremated. This even included some animals.."
"...But in the days of their youth neither had seemed to expect the preferment which the years had in store, and after the long course required of Xio Incali at the Xioquithlon, both had hidden the world of men adieu and had gone forth into the solitudes of the vast mountains, where only the Sons of Incal had abode, of all mankind. These men were the Theochristic or Occult Adepts of that olden age, the Yog-Vidya of their time. They were indeed chary of their wisdom, then as now; but to Gwauxln and Mainin they imparted it without stint. They had no families then, nor do these students of God, of Nature, deviate now from the same celibate principles. None who hope to achieve their deep knowledge will mate. After years had flown, so many that men had almost forgotten them, Gwauxln and Mainin did what few had ever been known to do--returned to the haunts of ordinary humanity. My father, Menax, had been but a babe when Gwauxln went away, and the latter's sister was not then born. Yet when Gwauxln came back, the silvery threads of age already gleamed in the hair of the Prince Menax, while as for the Rai that was to be, he looked a little more mature, but otherwise unchanged from the youthful semblance of the days of yore. In the interim, his sister had come to the world, grown to womanhood, wedded Menax, and after bringing into life their son, Soris, and their daughter, Anzimee, had gone into the undiscovered country through the Maxin gateway. Mainin, too, was of a similarly youthful appearance. "...Ganje, the capital city of Suernis"
"....I showed her the route(his travel to "india") I purposed to take; together we scanned the map, and I pointed out that from Caiphul on the extreme western cape of Poseid, my course would be east by north across the continent, the intervening ocean beyond it and between that point and further land. Then still on east across the country of Necropan, which country, now called Egypt, Abyssinia, etc., then embraced the entire continent of Africa, one government similar to that of Suern, and was inhabited by a people of kindred powers, but not nearly so far advanced. Africa was then not more than half its present size, while Suernis, which also embraced all of Asia, was much different from what it is to-day, but was a name more distinctive of the peninsula of Hindustan. Leaving Necropan(egypt), the route would be across the sea to India, or, as we knew the names, across the "Waters of Light" (in reference to their phosphorescence) to Suernis. From Ganje, capital of Suernis, our course was still eastward across the Pacific ocean, as it is now named, to our colonies in America, called "Incalia" by us, because in that far antipodal land, the Sun, Incal, was fabled as making his bed by that epic heretofore mentioned as the basis of Atlan folklore. From Southern Incalia,(america) (modern Sonora) I intended to go northwards and skim hastily over the desolate ice-fields of the arctic regions. What is now Idaho and Montana, Dakota, Minnesota, and the Dominion of Canada were then covered with vast glaciers, the rear-guard of the glacial epoch, which was slowly retreating, very slowly, even in so late a day, geologically speaking, as the days of Atl, reluctant to end its frigid reign. The trip could thus be made to afford novel and pleasing contrasts-tropical, semi-tropical, temperate and frigid." "Long as was our silver-white spindle, we had soon risen so high as to make us seem a mere speck to people on the earth beneath. Then for half an hour we flew at moderate speed through the high abyss, when a young lady called attention to an approaching vailx, following in our wake. Prince Menax, seated in a deck chair by my side, looked over the rail at the surface, more than two miles beneath, then he drew his heavy fur cape more closely about his shoulders, looked back over the hundred miles, more or less, of our course already covered in the half hour, and remarked that the other vailx was rapidly gaming on us. "Shall I give orders to the vailx-man to increase speed, that we may enjoy a race?" I asked of the company, which clad in arctic clothing, was occupying the passing time in sightseeing round about us on the open deck. "Nay, not so, my son," said Menax. I said no more, for it at that moment dawned upon me that the pursuer followed us by the prince's order. Menax now arose, bade the company good-bye and a pleasant trip, and then, Anzimee having arisen also, he put his arm about her and came back to me. As I stood up he passed his disengaged arm around me and thus we stood for some moments. Then releasing us, he ordered the two deckmen to throw grapples across to the other vessel, which at that moment grated alongside. The next instant he stepped on board the other vailx and signed to loose grapples. Thus we parted, high above the green earth, two miles beneath, he to return, we to go onwards...."
Before us lay a pleasure trip during which we should travel many thousands of miles. We proceeded slowly when we came above the base of the huge bulk of Pitach Rhok, the mighty mountain, and ascended somewhat, so that we should be on a level with its high point. When at the place, nothing would suit the company except a stop on the summit, and together we all placed foot in the snows on the pitach, which thing was done chiefly to please Anzimee, who said that the place was very interesting on account of what had there happened to me. Then, again, we were under way, descending from the higher altitudes in order to better view the thickly inhabited, though mountainous, country beneath us, between Pitach Rhok and east Poseid. At the approach of sunset a dull roar arose to the ear, and soon the long white shore of old ocean flashed beneath a moment, and in a little time was fax behind, with the waters, lead color in the twilight, beneath, behind, before and on both sides, no land in sight, and over one thousand miles east the country of Necropan. (egypt) Without going at a full rate of speed, we could not expect to be above that land in less than two or three hours. But as it would be dark ere reaching it, we slackened speed to an hundred and fifty miles per hour, closed the deck and went into the salon, where incandescent lamps lit up the darkening night-glooms. from Navaz and furnished with air of the proper density by the same Night-Side forces--all this tended to prevent ennui. Then too, the rapid transit changed the aspect of things beneath so fast that the spectator looking back-wards gazed upon a dissolving view. As an aside, the currents derived from the Night-Side of Nature permitted the attainment of the same speed as that of the diurnal rotation of the earth, e. g.: supposing we were at an altitude of ten miles, and the time the instant of the sun's meridian; at that meridian moment we could remain indefinitely, bows on, while the earth revolved beneath, at approximately seventeen miles every minute. Or, the reverse direction keys could be set, and our vailx would speed away from where it was meridian on the surface beneath, at the same almost frightful rate, frightful to one unused to it, as my reader is now, but one day will not be, if, as I hope, he or she will live to see vailxi rediscovered. Nor need the life be a very long one ere then. While we had such preventives of ennui, we lacked not commoner means of enjoyment. We had our naima, in the mirrors and vibrators of which our friends, however distant, could appear in image of form and of voice, lifesized and with undiminished vocal volume. The salons of the great passenger vailxa had libraries, musical instruments, and potted plants, amongst the flowers of which birds similar to the modern domestic canary darted about. At about the tenth hour it was reported that Necropan(egypt) was beneath, and at this surprising information, because at the speed I had ordered, we should have been at least six hours longer in coming to that country, I enquired of the vailxman his reason for increasing speed without orders. No good reason being given, I severely reprimanded the conductor, and ordered that a descent be made to terra firma, in order that we might travel by day over the Wasted Land, as our word Sattamund may be translated, which is the Sahara desert of to-day. This great wade some of our party had never seen, and to allow them the privilege we settled down to spend the night on an elevated ridge, high enough to be above malarious influences, for we were near where modern Liberia lies. Though we called it Sattamund, or the Wasted Land, yet it was not such an and region then as it is now. Water, if not as abundant as it was in Poseid, was abundant enough to give a wealth of tropical trees of the hardier sorts, sufficient at least to hide the nakedness of the slopes and hills of that old seabed. There were even a few saline lakes there, broad and blue, and it was around these that the population was centered. But the same dread catastrophe that overtook fair Poseid laid its terrible hand upon Necropan, and its beauty of verdure(vegetation) went out from the land, because the geological changes withdrew all the water from the surface, and hid it so that only artesian augers could find it. The same mighty throe rent the rocks through and through in Southwest Incalia, and to-day there is in that arid region scenery most fantastic, weird past the power of my pen to describe, where flows the Rio Gila, the Colorado, and Colorado Chiquita. But I will reserve the description, and when it is given it shall be in other words than mine, so that thou and I, my friend, shall together have the pleasure of enjoying a fine word-painting.